The compressive therapy line is constantly evolving, as is orthopaedics. That is why specialists from different teams ‒ doctors, physiotherapists, orthoprosthetic technicians and occupational therapists ‒ work together for these patients with different etiologies. Patients suffering from vascular or lymphatic pathologies, serious burns, ulcers… require very different compressive therapies. The team that will look after these patients, together with the appropriate garments, will make the pressure therapy successful. The compression tissues are specific to each pathology. So we use circular tissue garments to treat pathologies that are venous in origin, and flat tissue with low elasticity for those of lymphatic origin.These garments are usually made to measure. 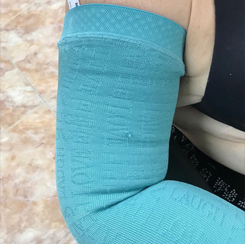 The rehabilitation and physiotherapy team will instruct patients with lymphoedema to go to an orthopaedic technician and have the appropriate measurements taken at the appropriate time, so as to have their garments ready at the end of the physiotherapy sessions. Low-elasticity tissues for keloids and hypertrophic scars in the epithelium. These are usually custom-made garments that will be worn for as many hours as possible to improve the appearance of the wound. 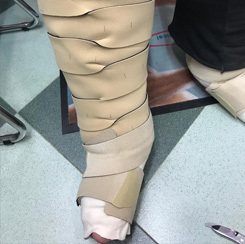 Currently, nursing teams treat ulcers with compressive therapy whenever possible, and when a venous origin may be one of the causes… this field is proving very successful. We have a wide range of socks and stockings to prevent mild oedema and post-surgical thrombosis, as well as ‘travel’ socks to prevent thrombosis on long plane journeys.